Tausi has that salty tangy smell and taste that it gives to meats and vegetables alike. The saltiness of the tausi is enhanced by the spiciness of the garlic and balanced by the green bell peppers. 1. 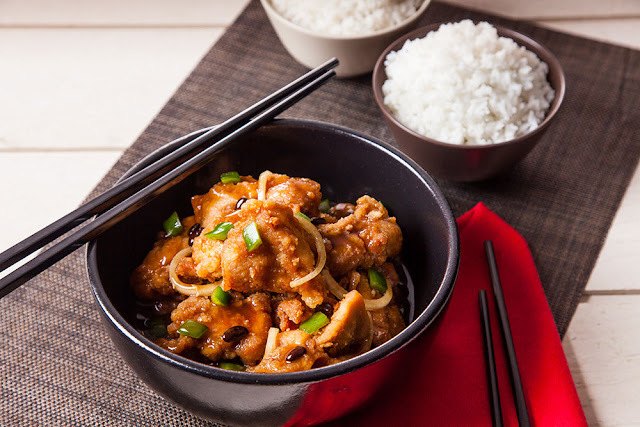 Combine all marinade ingredients and marinate chicken in soy sauce, Chinese wine, cornstarch and salt. Set aside. 2. In a pan, deep fry chicken in hot oil until golden brown. Set aside. 3. In a wok, sauté onions, black beans, garlic and bell pepper, then add chicken. 4. Add all sauce ingredients and sauté until chicken is well coated.